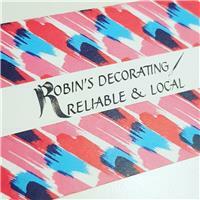 Robin's Decorating - Painter/Decorator based in Egerton Road, Surrey. Hello, I'm Robin of Robin's Decorating. Currently I work alone but hope to expand in the next few years. I have over 15 years of decorating experience as my father used to be a property devloper who I would assist with renovations when possible. I take my time with jobs, doing thing right, free quotes and no day rates. Check out my Facebook page, search for, "Robin's Decorating Weybridge".